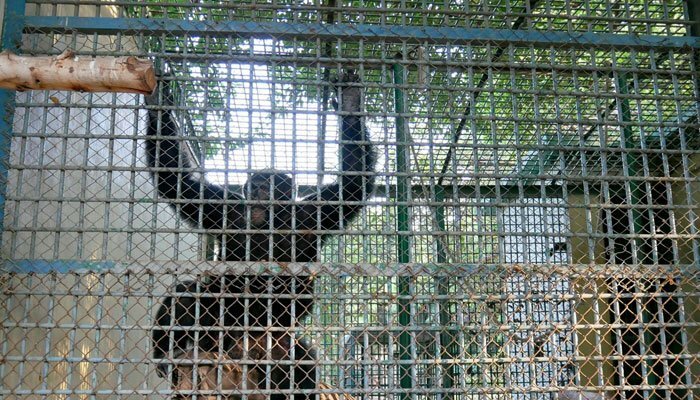 The screams of two captive chimpanzees at Karachi Zoo were brought to attention on social media by Pakistan Animal Welfare Society (PAWS) that unleashed an outrage by social media users. The welfare organization had turned to Twitter to bring to light the torture inflicted upon the two animals who were kept in solitary confinement and could be heard screaming from agitation. “One of the two captive chimpanzees at the Karachi Zoo screams in agitation as we are led beyond the barriers,” read their tweet. They had gone on to inform that humans and chimpanzees hail from a single ancestor sharing 96 percent of the same DNA as humans. “It is said that one of the worst punishments for humans is solitary isolation. It doesn’t take very long for a person to go mad in such circumstances. One can only imagine what the two chimpanzees at the zoo are going through, and for what crime they are being punished,” they had stated further. The twitter thread had further shared stories of animals who had passed on after getting subjected to negligence and torture. “Romeo, a male chimpanzee, died at the zoo in 2013 after he had been ill for weeks. A month later, a 4 year old female chimpanzee, Bubli, died at the Safari Park due to a 'cold night', as claimed by the management. "We think it’s the present cold weather that she couldn’t bear." The same year, Emma the Baloch black bear who was kept in a concrete pit in solitary isolation for 27 years also died. She was known to wake up each morning, bang her head against the walls of her pit and look up at the visitors. A three year old bactrian camel who was born at the zoo died of a hump injury in 2014. A few years before that a calf and an adult male camel died. In 2011, four lion cubs died. In April last year a Bengal tiger died of kidney failure,” they stated. The thread continued to share the Karachi city government’s plan of renovating the site and bringing in more wild-life animals into these confinements. “Perhaps its time we looked at saving habitats and letting our precious wild animals remain in the wild where they belong,” stated PAWS, bringing to notice a grave apprehension that goes disregarded often.